It doesn't even seem like it was that long ago that the Tigers were reporting for Spring Training 2016, and I was full of hope and optimism. (This is usually the best time to be optimistic. If you can't be optimistic before the season actually begins, you may have deeper issues.) Even while Vegas sportsbooks were targeting the Tigers for roughly 85 wins, I saw a clear path to a 90-win season and a division title. They damned near did it. Against the rest of the baseball world, the Tigers outplayed the Indians. Had the Tigers been able to just keep an even pace in the season series against the Indians, instead of going 2-13, they would be taking home the division title. And they would have won 90 games. So what went right and what went wrong with my predictions? Let's break it down. I wasn't wrong about this, necessarily. I looked at Pelfrey's pitcher profile, saw a guy who got a ton of ground ball outs, but also had been stuck with a garbage infield defense behind him in the past, and I saw opportunity. Keep up those ground balls, keep those walks down, keep the home runs to a minimum, and the magic middle of Jose Iglesias and Ian Kinsler will do the rest. It was a great theory, and in spring training, it even looked like it was working. I still remember being legimately excited to see Pelfrey make his first official start for the Tigers. Isn't that funny? Contemplating a Mike Pelfrey start and actually being eager to watch? What I didn't know is that Pelfrey was going to eat his pitcher profile, eat his career average numbers, puke all over the bed, find an entirely different bed, and puke all over that one too. Pick any stat you want. Walks per nine innings, WHIP, FIP, strikeouts per nine innings, home runs per nine innings -- they were all worse than his career averages, every single one of them. He walked more batters, gave up more home runs, struck out fewer batters, and made everyone miserable. 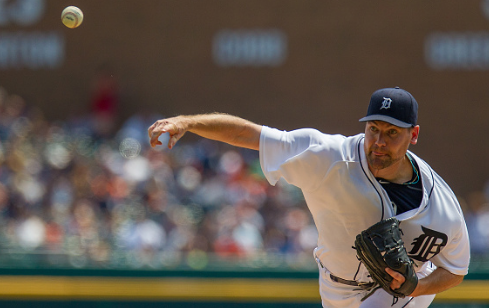 The Tigers have lost 12 of Pelfrey's starts. After watching the way he finished the 2015 season, I didn't feel like it was too much of a stretch to predict that Justin Verlander was going to have a good 2016. He surprised me, though. I knew he'd be good, but I had no idea he'd be that good. He struggled for his first six outings, but people were patient and level-headed about it. Haha, I'm only kidding! People lost their minds! "Verlander was such a waste of money could've spent that on Scherzer...."
"After locking up Kate Upton, #Verlander has no reason whatsoever to pitch well. #Tigers are doomed." "Justin verlander is hands down the most overrated and overpaid player in baseball"
"People talk about how bad pelfrey is. Look at our "ace" Verlander. #tigers #tradehim"
"Does anyone remember when Verlander was good?" After one bad start in early May (against the Indians, unfortunately), Verlander put up the following numbers: 25 starts, 172 1/3 innings, 2.56 ERA, 3.22 FIP, 0.928 WHIP, 9.9 strikeouts per nine innings, and a strikeout-to-walk ratio of 4.8 -- his ERA+, his WHIP, his strikeout-to-walk ratio, and his hits-per-nine innings stats in that span are all nearly identical to his 2011 Cy Young season. His strikeouts-per-inning in that span is better than his 2011 Cy Young season. Remember when Jordan Zimmermann pitched 24 1/3 scoreless innings to start the season and finished the month of April with a 0.55 ERA? He only made twelve starts after that. Twelve. Multiple trips to the DL interrupted his season, and over those twelve starts between May and September, he posted an ERA of 7.16 while opponents slashed .313/.351/.574 against him. Like Pelfrey, Zimmermann has had a season far worse than his career averages -- more baserunners, more hits, more home runs, more walks, fewer strikeouts, and fewer quality innings. He did not have the year I predicted he'd have. I explicitly said Sanchez wouldn't do this. I was wrong. After having a career-worst year in 2015 -- not just by a few inches, either, we're talking a barn-burner of a nasty season -- I said there was no way he could repeat that. It was so obviously a blip on the radar, a statistical anomaly. Let's put it this way: in 2015, Sanchez gave up a career high 29 home runs over 25 starts. In 2016, he had already given up half of that number in just 11 starts. He was on pace to beat his own worst record. He probably would have, too, if the Tigers hadn't pulled him out of the rotation in June and stuck him in the bullpen, instantly giving the team the highest-paid reliever in the business at $17M per year. He went to back to a limited starting role for July, August, and September, where for 13 starts he's put up a 5.75 ERA and a more respectable 1.4 home-runs-per-nine-innings rate (in April and May that number was 2.2). The Tigers have lost 18 of Sanchez's starts. The mantra was: 30-40 games, 30-40 games, Upton goes on hot and cold streaks every 30-40 games. It was true, as far as it went, but the hot streaks just weren't as hot this year, nor were they as frequent. For the past three years of his career, Justin Upton has always had at least four months per season where he put up run expectancy totals above zero (and zero is average). 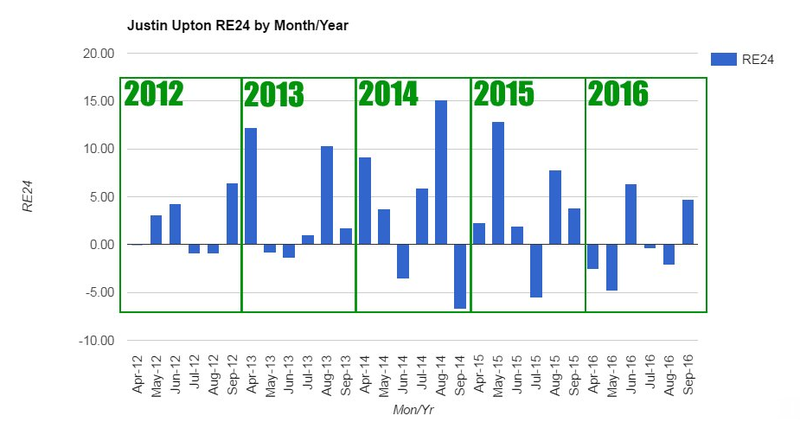 The chart also shows that in 2013, 2014, and 2015, his months of positive run expectancy hit much higher totals -- he had at least one month in each of those seasons where his run expectancy spiked above +10. In 2016, he's only had two positive run expectancy months, and has yet to crack the +10 mark this season. His batting average, on-base percentage, slugging, and OPS are all well below career norms. His strikeout rate is currently 29 percent, which is above his career rate of 25 percent. Like Pelfrey, like Zimmermann, like Sanchez, Upton is having one of his worst years ever. The season's not over yet, but basically, yeah it is. There's always a chance that the Tigers could sneak into a second wild card, or maybe a tie-breaking Game 163, but if you've watched them all year round you already know the problem: they're just not well-rounded enough this year to be much of a threat to anyone in the playoffs. They're one of the lowest-scoring teams in the American League, dragged down by below-league-average performances out of Cameron Maybin, Jose Iglesias, James McCann, and a hobbled Victor Martinez. Nick Castellanos, who was shaping up to have a breakout season, probably won't even play again in 2016. But next year could prove to be immensely better. A return to form for Jordan Zimmermann would give the Tigers a formidable 1-2-3 front of the rotation with Verlander and Michael Fulmer. A Justin Upton who seems to have solved American League pitching (finally) and who can deliver some of those signature months of outrageous run expectancy would be a huge boost to the offense. Hell, even having a normal version of Mike Pelfrey would help tack on a few extra wins, instead of taking away those extra wins that are going to end up being all the difference this year. I was right about some things. I was wrong about others. But mostly I've just been bewildered.